"The fastest-selling cultural product in history was created by people you've probably never heard of. While this year's Oscars honoured films in which the movie business sweetly congratulates itself on its own birth – The Artist, Hugo – the most dollar-hoovering entertainment release ever is not a film, still less an album; it's a video game. Coming out last autumn, Modern Warfare 3 – a blockbuster military shooter made by a Californian game studio called Infinity Ward – took just 16 days to gross $1bn, beating by one day the previous record set by a film about blue people in space. And it wasn't a freak accident. Global annual sales of video games now dwarf cinema box-office and recorded music: in 2010, games grossed $56bn, film tickets $32bn and music $23bn. (The film industry as a whole still made more, at $87bn.) Even social games on Facebook are enormous business: Zynga, the firm behind Farmville and Words With Friends, is responsible for 12% of Facebook's revenue. Hollywood is old-school now. And one company in particular has played a pivotal role in this media revolution over the past decade: Rockstar Games. Max Clifford was hired to advise on the PR for the game's 1997 release. Cannily, he advised DMA to feed the tabloids the most outrageous details possible. 'It was scary and impressive how he laid out his plan to manipulate the media and the politicians,' Jones says. 'It culminated in a two-hour feature on breakfast TV debating the game. At this point, the politicians lambasting the game had not even seen it – I think they were disappointed when they did, given the cartoony look.' The tabloids duly issued calls to ban this sick filth, the British Police Federation said it was 'sick, deluded and beneath contempt', and the game became a hit. Grand Theft Auto the countercultural phenomenon was born. 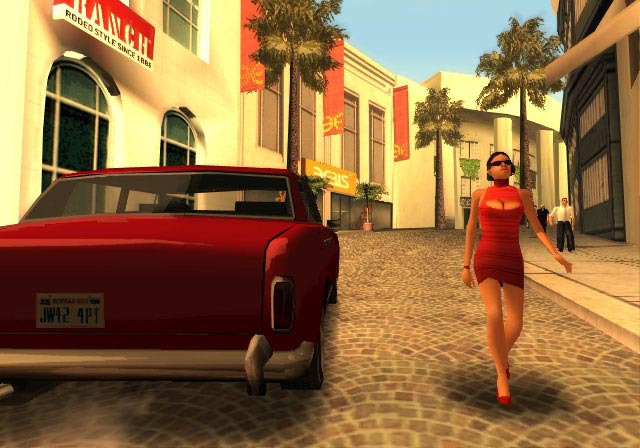 Virtual tourism is, indeed, the aspect of the Grand Theft Auto games that has been much more influential for the medium as a whole than their gangster-movie envy. They made popular and compelling an 'open-world' style. If you want to progress through the game's scripted narrative, you must accept specific missions of telegenic spatter-mayhem; but that is not all you can do. Instead, you may just wander around and soak up the sights, which these days are impressive. That video games now provide a place where you can go to relax is itself a sign of their rapidly burgeoning capacity for rich simulation. 'We have all been born 100 years too early,' Dave Jones laments wryly. 'I would love to build and play in the kind of environments we see in movies like The Matrix and Inception.' But, he notes, we are still in 'the stone age of gaming technology'. Jones's own most recent project, APBReloaded, is like a networked GTA: the other people in the city are not scripted, artificial characters, but human beings playing over the internet. His vision for the future is like this, only more so: 'I want to be playing in an even more realistic GTA-style environment,' Jones says, 'with 1,000 other real players in the city.' And so the impish simulation of antisocial behaviour promises to become ever more sociable." Thanks to our friends at Rockstar Spy for the tip-off and join us at the Grand Theft Auto V forums!